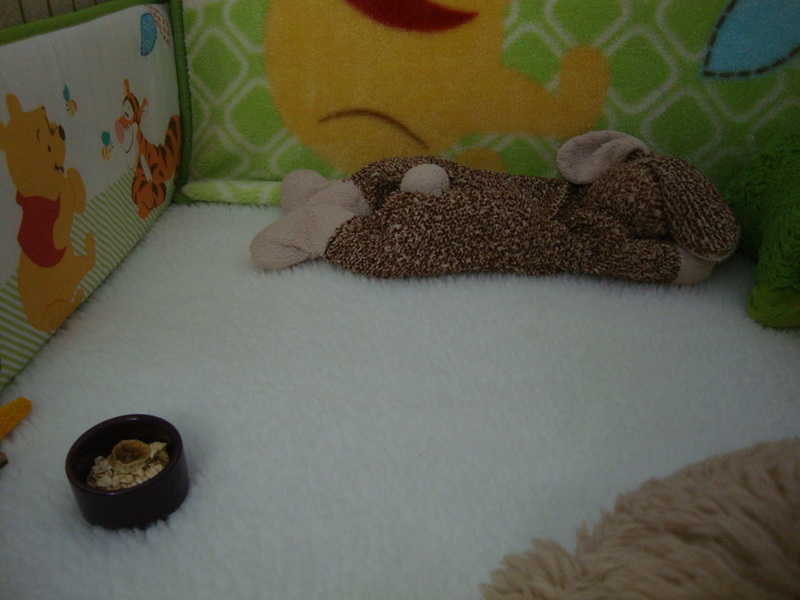 Bedding options and tips for your disabled rabbit. The exception is a note that we will make for rabbits that suffer from head tilt. Head tilt rabbits need bedding that provides support and facilitates safety. We recommend lining their enclosure with rolled towels or baby crib bumpers as a buffer to prevent injury and to allow for support. See the picture to the right for an idea of how to roll the towels. We want to start by showcasing the bedding setup that we use. We'll talk about the layers and components below. While there are many variations on how to set up bedding for a disabled rabbit, these are the layers that we use and have been successful using. Use this as a guide while you work with your setup to find what works best for you and your rabbit. We will discuss each layer below. The first layer of bedding needs to be a base- something to line the top of your floor to act as a final barrier for any mess that may get through the upper layers of bedding, as well as provide some cushion or padding to make the area more comfortable. This layer should be somewhat thick, perhaps lined with a rubber or plastic bottom. A square of extra carpet or a rug can be a great base for other bedding. Both will provide cushion and provide a barrier so that any messes will not reach your actual carpet. Both options can be vacuumed or cleaned with carpet cleaner, but only rugs can be washed. Buy a square large enough to cover your rabbit's flooring. Bathroom mats available at most stores and many come with a rubber-lined bottom. This helps prevent leaks and keeps the bedding from slipping, which is especially important on wood or tile floors. These mats also have the benefit of being easily washable in case of slips. Buy a large mat to cover your rabbit's flooring. Plastic carpet protectors are thin plastic liners that go over your carpet. They are designed to prevent any messes from getting through to the carpet. They can be wiped clean easily, but these will require an additional non-slip bedding layer on top of them to provide traction. Buy a section large enough to cover your rabbit's flooring. Pads designed to soak up urine are the next layer of bedding. Whether washable or disposable, these pads are essential for keeping the above layers dryer and for drawing urine away from layers that touch the rabbit in order to keep them, and the rabbit, as dry as possible. They also catch urine and keep it from reaching bottom layers and, ultimately, your floors. Disposable pads, such as Petco Essentials All Purpose Potty Pads, contain a quick-dry top with a plastic no-leak bottom designed to grab and hold urine. They fit easily under bedding. They can be easily disposed of when soiled and replaced with a new pad as needed. They are often cheaper when bought in bulk. Washable pads, such as PoochPads Reusable Housebreaking Pads sold online and by Petco, contain ultra-absorbable fibers that can absorb up to four times their own weight in liquid. They are a great alternative to disposable pads and save money in that they can be laundered easily and reused. *Note: Be careful when purchasing pads, especially disposable ones. Many pads contain an 'attractant' designed to encourage puppies to use them, and these are not suitable for rabbits. Look for ones suitable for adults or that are more specifically designed for incontinent animals that do not contain any added fragrances. Bonnie rests on her EZ Whelp Pad. We personally use and recommend EZ Whelp Washable Whelping and Puppy Pads. They are specially designed to wick moisture away from the top surface while holding it above the bottom side waterproof barrier. They were made to maximize absorbency and minimize leaks while still allowing for hundreds of washes. They are soft, supportive, help to maintain warmth, and hold up very well while keeping our disabled rabbit as dry as possible. They are also relatively inexpensive and easy to change out and maintain. Towels are the next key layer of bedding. They provide a buffer between the pads below and the sheepskin above (see below) with the goal of keeping the top layer as dry as possible for the rabbit. We recommend purchasing a handful of cheap white towels from your local Walmart or Target (or equivalent) and switching them out as needed. We recommend white because it allows you to keep an eye on how soiled the towels get so that you can change them when appropriate. Fleece, sherpa fabric or synthetic sheepskin should make up the important top layer of bedding. These materials are designed to wick wetness away from their surface. In the case of a incontinent or semi-incontinent rabbit, this means that urine is drawn quickly away from the surface in order to keep your rabbit as dry as possible. Rather than the urine sitting at the top of the bedding, it drips through the bedding to the next layer of towels and then is held in the pads below. This top layer is also vital in that it provides a disabled rabbit with padding for comfort, warmth and orthopedic support. One top layer fabric option is the Palace Pet Bed. These beds are popular among disabled rabbit owners as they are made specifically for animals struggling with orthopedic problems, incontinence, and injury recovery. They have a superior fiber density designed to wick moisture away from your rabbit. They are non-allergenic, non-toxic and non-irritating, will not unravel, are lightweight, anti-bacterial and are resistant to staining and chewing. They are also available in various sizes to fit any setup or need. 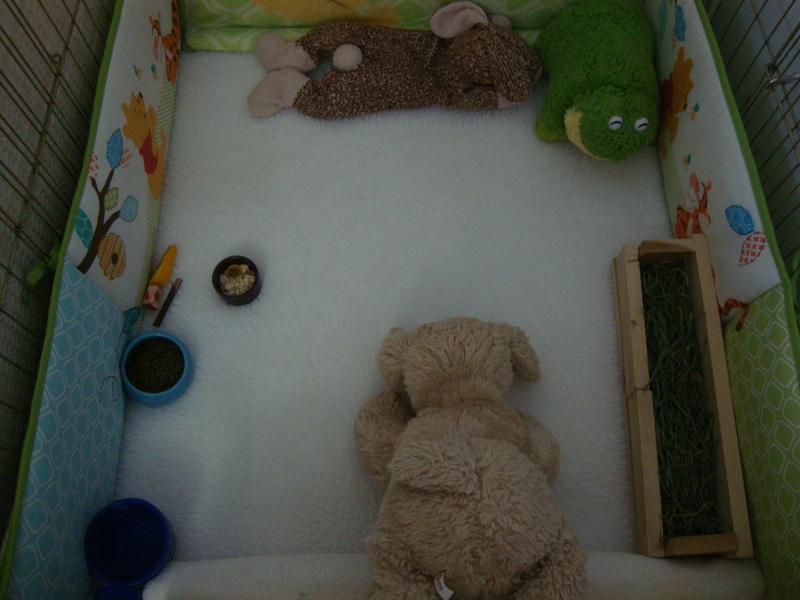 Please keep in mind though, that this bed can be a little thick for some rabbits and, for some, can impede mobility. Buy carefully. Another common top layer option is Petlife's VetBed. VetBeds are common among disabled rabbit owners- even among veterinarians. They are durable, hygienic and comfortable. Special fibers within the bed pull moisture and fluids away from your rabbit, keeping them dry and cool. They are also stain resistant, non-allergenic, non-irritating and non-toxic. They can be laundered and reused and hold up well over time. These beds are a little thinner than the Palace Pet Beds to the left. They are available in a variety of sizes, so they can fit easily to any enclosure. The manufacturer is based in Canada but also ships to the U.S.
A less expensive alternative to the brands of fabric mentioned above is plain sherpa fabric. Sherpa fabric can be purchased by the yard at a fabric store, such as JoAnn Fabrics (click on the photo above for the link to purchase online). Sherpa fabric acts much in the same way as the beds above. It allows urine and wetness to fall through to the layers below while keeping the top of the fabric relatively dry. It is thinner and less 'sturdy' than the beds above, but some rabbits (depending on disability and need) do better on this thinner fabric. Due to the thinness of the fabric, they may need to be replaced more quickly than higher-end fabrics, but it is still an effective top layer for your disabled rabbit. We like to add a small bed on top of the fleece layer as a sleeping place for our disabled rabbit. A bed is great to put under a hideaway for a cozy place for your rabbit to snuggle. There are tons of options, including some that you can make your own. We highly recommend Happy Rabbit Toys Sleeping Pads. These pads are great for smaller sleeping areas for a disabled rabbit. They are reusable, easy to clean and very soft and comfortable. They are made with high quality fleece on top and bottom with recycled denim, an extra-absorbent and lightweight fabric, in the middle. 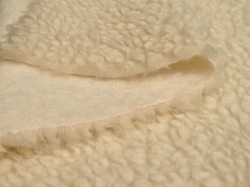 The seams are buried deep inside the dense fleece so your rabbit will not be able to pull them apart. Besides being a comfy bed, they are also able to absorb and hold urine without leaking. They can even be used inside a litter box, in a litter area or to line a carrier for traveling.